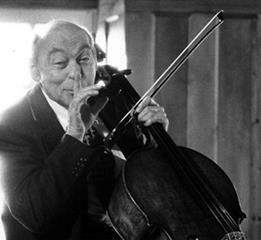 Just seen this news on Norman Lebrecht’s ‘Slipped Disk site – “… The great cellist and teacher Janos Starker died today at 5am. He was 88 years old and had been in terminal care for the last few weeks. Budapest born, to Jewish parents who arrived from Poland and Russia after the first world war, Janos began teaching other kids at eight years old. He studied with Bartok, Kodaly and Dohnanyi at the Liszt Academy and was fortunate to survive a Nazi camp; his older brothers were killed. Three cellists die and ascend to the pearly gates, where they are greeted by St. Peter. Cellist number one requests entry into Heaven. “With whom did you study?” St. Peter asks. Cellist number three nervously asks to enter the gates to Heaven. “Come in, welcome!” says St Peter, now smiling. This entry was posted in About Brendan Ball and tagged cellist, cello, Janos Starker. Bookmark the permalink.